Educated in the established traditional way of Shia Theology by well known jurists, he joined the world-renown theological institution in the holy city of Najaf Al-Ashraf in 1912, the year he migrated from Iran. At an early age, he attained the degree of ijtihad i.e. the process of arriving at judgements on points of religious law using reason and the principles of jurisprudence. This achievement normally warrants the title of 'Ayatullah'. He is considered as the architect of a distinct school of thought in the priciples of jurisprudence and Islamic law, and one of the leading exponents of 'kalam'-scholastic theology- and 'rijal'- study of the biographies of transmitters of ahadith, the Prophetic traditions, 'fiqh'- jurisprudence- and 'tafseer'- exegesis of The Holy Qur'an. His interests included astronomy, maths, and philosophy. Minhaju-us-Saliheen (The Path of the Righteous) - 2 volumes, reprinted 78 times ( guide book on religious practice and law ) . Anthology of Religious Questions - Concise version of the Path of the Righteous - in Arabic, Urdu, Farsi, English, Turkish, Thai, Malay, Indonesian, and Gujarati. Mabani al-Istinbat ( Edifices of Deduction) Principles of Jurisprudence. Nafahat-ul Ijaz ( the Fragrance of Miracles ), in defence of The Noble Qur'an. Ayatullah Al-Shaheed As-Sayyid Mohammad Baqir As-Sadr, Iraq, As-Sayyid Mahdi Al-Hakim Mohammad Mahdi Shamsuddin ( Lebanon), Imam Mousa As-Sadr ( Lebanon),As-Sayyid Mohammad Husain Fadhlallah ( Lebanon ), Ayatullah Seyyid Mohammad Al-Rohani ( Iran), Ayatullah Al-Ardabili, former Chief Justice of Iran , As-Sayyid Mohammad Ali Makki (Syria), As-Sayyid Mohammad Ali Bahrul 'Uloom (UK), Poet Mustafa Jamaluddin ( Syria ) . 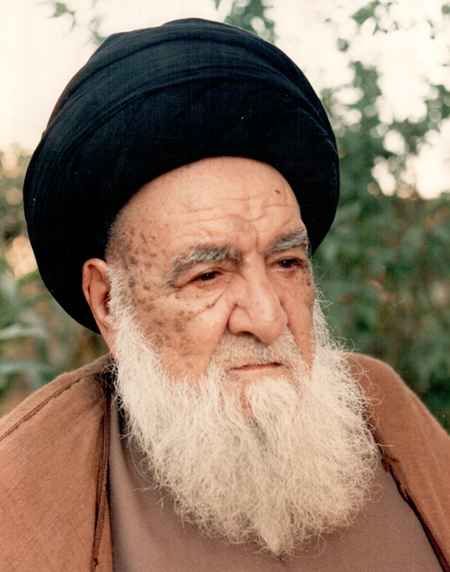 After the death of As-Sayyid Mohsin Al- Hakim in 1972, Imam Al-Khoei succeeded him as The Grand Ayatullah ( Al-Marja'a Al-a'alam) as he was the most knowledgeable of the 3 living Grand Ayatullahs. He had the greatest following among the Shias worldwide. Imam As-Sadiq Education Institute for Boys, London, U.K.
Imam As-Sadiq Education Institute for Girls, London, U.K. He was also the patron of about 1,000 grant-maintained students of theology from Iraq and other countries like Lebanon, Syria, Gulf States, India, Pakistan, Iran, Afghanistan, South East Asia. He provided financial support for maintaining the schools including boarding expenses, teachers' salaries and lodging costs. Cultural Complex, Bombay , India. Considered among the biggest Shi' ite Muslims cultural centre-under construction. Representative Offices catering for the religious, social, educational, and cultural needs of Muslims all over the world,with the Headquarters in London, U. K. and branches in the United States, Canada, India, Pakistan, U.A. E., Oman, Saudi Arabia, Thailand, North Africa, Syria, Lebanon, Malaysia. Imam Al-Khoei was a man of peace dialogue and understanding. He advocated non-violence and promoted tolerance,the values which mirror the human and universal principles of Islam. In the aftermath of the violent crushing of the popular uprising in Iraq after the Gulf War by Saddam's troops, he was arrested with all members of his family, and many ulama, taken to Baghdad, and under duress was made to appear with Saddam on TV. Under mounting pressure, Saddam returned him, without his family, to Najaf, where he was placed under house arrest on the 20th of March, l99l. Mass genocide, destruction, arrests, and displacement of civilians in Najaf, as well as in other cities and towns in the South of Iraq and North perpetrated by the brutal Iraqi regime, left many cities virtually deserted and normal life came to a halt. All classes in Najaf came to a standstill, especially after the grave restrictions and constraints on the freedom of the Spiritual Leader. After his death a year later, Saddam's regime closed down the institute and deported, arrested and harrassed over 1000 students who had been registered with the institute. The Muslim world lost one of its brightest stars when Grand Ayatullah, Abul-Qasim al-Khoei died at his Kufa home of heart failure. He was born on Rajab 15, 1317 A.H. (November 19, 1899) at Khoei in Iranian Azerbaijan, heartland of many great Shi'a thinkers and sufis, ascetics. Even in his early childhood, al-Khoei was versed in religious Persian and Arabic poetry and languages, and in Turkish as well. It was in 1330 A.H./1912 A.D. that al-Khoei, who was then only thirteen years old, migrated to al-Najaf al-Ashraf, Iraq, in pursuit of knowledge. Even then, he was characterized by brilliance and a readiness to absorb knowledge and scholarship. In all stages of his study and research, progress and success were his companions. Ten centuries ago, a university-type hawza was founded by the most knowledgeable person then alive, namely shaikh Muhammad ibn al-Hassan al-Toosi, may Allah have mercy on his soul. Al-Toosi was an intellectual giant, a genius by all standards, and a man who was able to absorb various types of knowledge and science. He was the undisputed authority in fiqh, the founder of the science of hadith, an innovative mentor of the science of usool, nay, the scholar of scholars in all branches of knowledge related to the science of biographies, akhlaq, and ilm al kalam. Thus did al-Toosi lay the foundation for the hawza which has been functioning since then, i.e. since 449 A.H. If we were to research the fountainheads that nurtured the intellect of the late al-Khoei, we will come across a list of the finest among all contemporary scholars such as Shaikh Fath-Allah who is better known as Shaikh al-Sharee'a al-Isfahani, Shaikh Mahdi al-Mazandarani, Shaikh Diyaud-Deen al-Iraqi, Shaikh Muhammad Hussain al-Kampani al-Isfahani, Shaikh Muhammad Hussain al-Naeeni, Shaikh Muhammad Jawad al-Balaghi, and others. All of these men were considered as pioneers in the fields of their specialization. The impact of these men on shaping the mind of the late al-Khoei is best described by al-Khoei himself who has said: "I have learned from each one of them a complete course in the science of usool, and digested a number of books in the science of fiqh, for many years. I used to provide a critique of the research relevant of each one of them before a number of scholars who specialized in that branch of knowledge, and my audience included a good number of very highly respected scholars. Al-Naeeni, may Allah have mercy on his soul, was the last mentor I used to accompany more frequently than anyone else." His son, Sayyid Abdel-Majeed al-Khoei, says the following about his father, "My father was always smiling when he was with us. He always arbitrated between his sons whenever there was a dispute, and he was quite witty. If he saw one looking forlorn or happily excited, he would ask him about the reason, and every evening he would distribute candy for the children in addition to whatever other gifts he had received that day from the admiring faithful." Despite his extremely lofty status, he never hesitated to help his family in domestic chores, including kitchen chores. He never opened the mail coming to any of his family members. One of his sons told him once that nobody in the house had any secret to hide from him, and that it was perfectly alright with them if he opened their mail, but he insisted never to do so. He always instructed members of his family to deliver funds for highly esteemed but impoverished families without doing so publicly, telling them to help those whom the ignorant ones mistake as wealthy because of their abstention from begging for help. After the failure of the Intifada of March 1991, the Grand Ayatullah was briefly imprisoned then forced to appear on television with the Butcher of Baghdad Saddam Hussein who always kept pressuring him to issue fatawa, religious verdicts, supportive of Saddam and his government, something which he never did despite all the persecution to which he, his representatives and family members were subjected. Because of refusing to cooperate with the dictatorial government of Saddam Hussein, he was put under house arrest till his death. Saddam also exiled, jailed, or assassinated many of the gifted students, representatives and distinguished followers of al-Khoei and ordered the destruction of their mosques and libraries particularly those in Najaf and Kerbala. As if the Iraqi government predicted the death of al-Khoei, it cut off all telephone connections with his Kufa residence in the morning of Saturday, August 8, 1992 and with the houses of those who were close to him. Having performed the afternoon prayers that day, the health of his late holiness suddenly deteriorated and a severe chest swelling was visible. Doctors in the medical team charged with supervising his health conditions was called in, but they could not tend to him early enough. He informed his family and those in his presence that last night he felt that it was the last night he was spending with his family. He asked for water to perform his ablution, and as soon as he finished his ablution his soul passed away to its Maker exactly at 3:13 pm. A three-day mourning period was announced by the government which prohibited the family of the deceased dignitary from holding the traditional Fatiha majlis, Baghdad's official newspaper Al-Jumhuriyyah called him "the martyr of Islam and the nation," publishing his photograph on its front page. International news agencies, on the other hand, published photographs of his coffin escorted by no more than six persons. Shortly before his death, the greatest scholar and leader al-Khoei expressed no concern about anything in this vanishing life more than the possibility of the loss of his precious manuscripts the writing of which had exhausted so many years of his life... Surely the Islamic world will find it very hard to compensate for the loss of such a man, nay, a legendary institute and a lighthouse of knowledge and scholarship... Inna Lillah wa Inna Ilyahi Raji'oon.